The ancestors of the domestic goose are derived from two distinct wild species. Western (European) breeds have been developed from the greylag, and Asiatic breeds such as the African and Chinese from the swan goose. Despite their separate origin, the Asiatics and greylag types do inter-breed. Crosses of the Asian and European types have produced distinctive breeds of Russian geese such as the Tula, Arsamas and Kholmogory, plus the beautiful blue German Steinbacher. White breeds range from the heavy white Embden (up to 34 lbs) down to the tiny white Czech at only 9-11lbs. As well as these white birds, there are the beautiful American and Brecon Buff and the grey Toulouse. 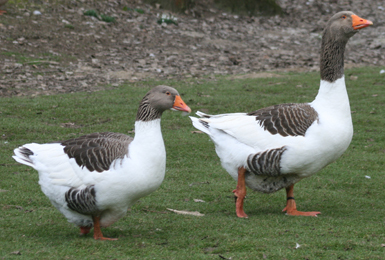 Geese also come in 'pied' varieties - the Grey Back and Buff Back - as well as the curly-feathered Sebastopol. These breeds were all developed from the wild greylag. Out of the 14 UK standardized breeds, only a few breeds - the Brecon Buff and arguably the autosexing breeds - are indigenous to the UK. German Pomeranian geese are single-lobed. 'Pomeranian' is strictly a type rather than a colour. This breed is standardized in Germany in white, whole grey and grey back. In the UK, grey back is the popular colour, but the grey is equally popular on the continent. The German birds also have a distinctive, bold head, and an orange-pink bill - rather than just plain orange. The Embden (left) originated in Germany, but is a popular breed in the UK and USA. 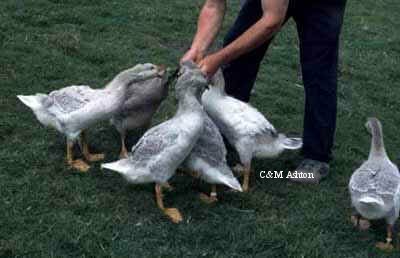 Along with the Toulouse, it was the first goose breed standardized in the UK in 1865. British birds are heavier than German birds and reach up to 32 lbs in exhibition strain ganders. Any white goose is not an Embden. 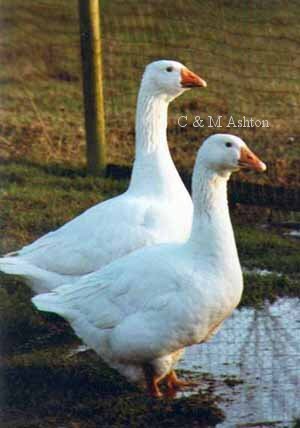 There are many varieties of commercial geese which are white, but these are generally smaller and easier to breed because they have been developed as commercial crosses for a high output. The true UK Embden has a proud stature and reaches a metre in height. Ganders weigh 28-34lbs and females can reach 28lbs. They typically lay about 30 eggs.